The Smart Grid: Technocracy or Just a Smarter Future? Reactionary vs. Precautionary Approach; What Can You Do? This past week has been one of the worst ever for “smart meters” in terms of critical news reporting and negative revelations about these devices. 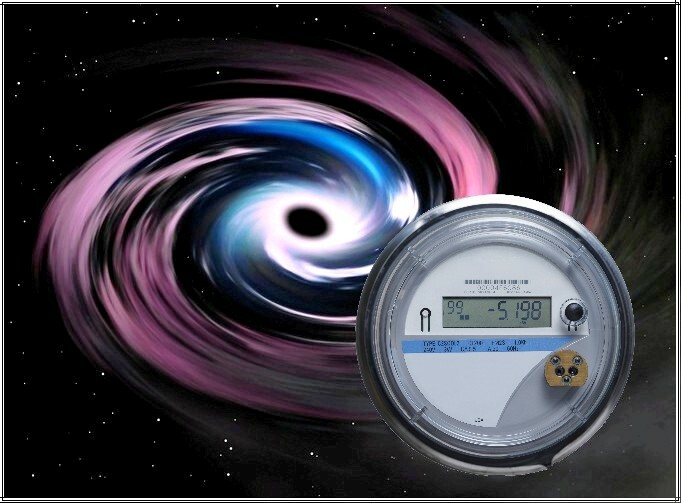 Clearly, things are quickly spiraling out of control worldwide in terms of anybody believing that the smart meters are anything more than a giant and costly albatross hanging around the necks of consumers. “[P]olicy problems are symptomatic of a national programme that the Government has left largely to suppliers and failed to drive forward effectively. Consequently, we do not believe that near-universal smart meter roll-out will be achieved by 2020. Without significant and immediate changes to the present policy, the programme runs the risk of falling far short of expectations. At worst it could prove to be a costly failure. This revelation has consumers questioning the wisdom of the government mandated smart meter program in Victoria which is now expected to cost over $2.4 billion. 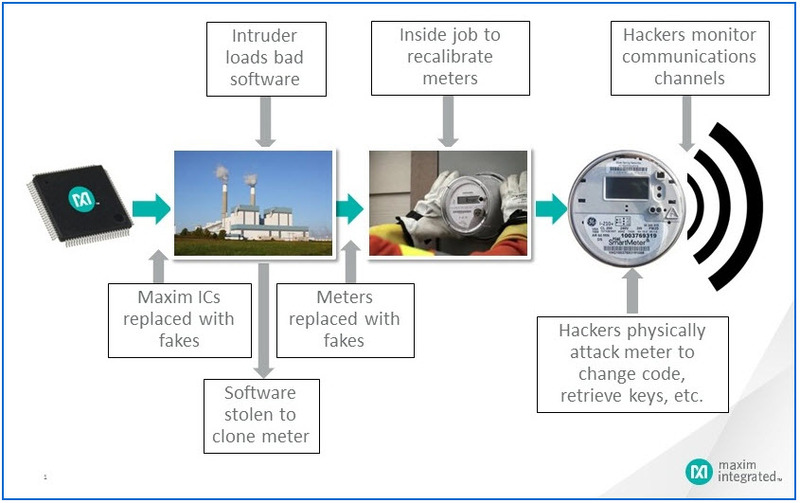 Quoting an industry article and using a graphic (shown below) from Maxim Integrated on the subject of tampering, it is stated that security is going to be an issue for all utilities that adopt smart metering and that it must be given its “due consideration.” In fact, as will be demonstrated later, security is not being given proper consideration. “For now, … consumers largely remain ‘rationally inattentive’ to how much electricity they’re using at home, explains David Rapson, an economist at the University of California at Davis. The information is just too obscure and difficult to obtain — and there are a lot of other ways to spend your day, as well as seemingly easier ways to save money. On March 12th, a news report from Oklahoma declared that “Smart Meters Called a Major Threat to Health, National Security.” I don’t agree with the entire technical content of this particular article [*], but I do agree with the headline about smart meters being a threat to national security which leads to the next story on cyber security threats. “According to Norm Judah, chief technology officer with Microsoft Services, the most popular topics in the industry — or what he labeled the ‘shiny thing in the sky’ — changes. Most recently, it’s been big data. Now, it’s the Internet of Things. “The scary thing about the Internet of Things is that it’s wildly insecure and unpatchable,” Judah told the audience. One would have to ask, with all the risks, why are utilities irrationally rushing to deploy smart meters and enable them as part of the Internet of Things (IoT)? Is it just that they don’t want to get left behind in the quest for the next “shiny thing in the sky”? Note that, according a Gartner report released this past November, the utility sector will lead in the number enabled IoT connected devices by the year 2020 because of its investment in smart meters. Well, that is not really very reassuring. Unfortunately, although the people at the conference seemed to acknowledge the tremendous cybersecurity threats and that you can’t put your “heads in the sand,” it did not seem to occur to them that companies should at least put their deployments on hold to better scope out the issues and work on possible solutions. Instead it was stated that there are “positives” that the smart grid can bring to consumers, and these supposed benefits are being “overshadowed” with security concerns and “indecisiveness” about what to do about those issues. So apparently the current state of affairs on cybersecurity is that we are “livin’ on a prayer” and that somehow we are going to take action to do better in the future and not ignore the problem. With that sort of cybersecurity action plan, the results will likely be catastrophic … as things continue to also spiral out of control on the costs associated with smart meter deployments. People in authority are shirking their responsibilities to act in a prudent manner that would protect the interests of the consumer and the well-being of our society and future generations. Unfortunately, it appears to be up to informed activists and consumers to hold governments and corporations accountable for their actions and to force them to behave in a more responsible manner. The distressing part of this whole situation is how valuable resources are being diverted and wasted on smart meters when the money could so easily be spent on infrastructure upgrades that would actually improve the grid and harden it against physical and cyber attacks as well as from the effects of solar storms, etc. Instead, we are making the grid more vulnerable to catastrophic events by not spending the money where it needs to be spent and wasting it on smart meters. It is truly an unbelievable pathway that we find ourselves. “Cybersecurity is Super Scary,” at http://www.intelligentutility.com/article/15/03/cybersecurity-super-scary; also refer to http://web.archive.org/web/20150314145216/http://www.intelligentutility.com/article/15/03/cybersecurity-super-scary if original link not available. “IoT to Enable 25 Billion Smart Things by 2020,” at http://www.smartmeters.com/iot-enable-25-billion-smart-things-2020/; refer to http://web.archive.org/web/20150314145256/http:/www.smartmeters.com/iot-enable-25-billion-smart-things-2020/ if original link not available. Raising public awareness and finding solutions for smart grid issues related to invasions of privacy, data security, cyber threats, health and societal impacts, as well as hazards related to radiofrequency (RF) radiation emissions from all wireless devices, including smart meters. This entry was posted in Smart Grid, Smart Meters, and RF Emissions and tagged Cyber Security, Cyber Threat, Government Waste, Smart Grid, Smart Meters. Bookmark the permalink. Unauthorized use and/or duplication of material from this site without express and written permission from this site’s author and/or owner is strictly prohibited. Excerpts and links may be used, provided that full and clear credit is given to SkyVision Solutions and Smart Grid Awareness with appropriate and specific direction to the original content. "Smart Grid Security: Threats, Vulnerabilities and Solutions"
Congressional Testimony: ‘Smart’ meters have a life of 5 to 7 years.